ARIA is FDA’s active post-market risk identification and analysis system, which is comprised of pre-defined, parameterized, reusable routine querying tools, combined with the electronic data in the Sentinel Common Data Model. Because ARIA uses parameterized tools and a trusted multi-site distributed database that undergoes continuous quality checks and refreshes, safety analyses can be done more efficiently to conduct medical product safety surveillance to fulfill the mandate in the FDA Amendments Act of 2007. For technical details concerning all of Sentinel’s analytic tools that support ARIA, click here. 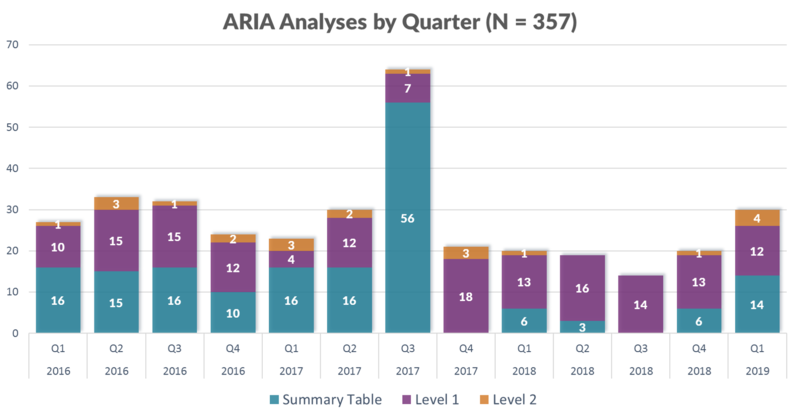 This graphic displays the total number of analyses conducted by FDA in Sentinel’s Active Risk Identification and Analysis (ARIA) system since its launch in 2016. There are several types of analyses, including summary tables, Level 1 analyses, and Level 2 analyses, and more technical information on these analyses can be found on the Routine Querying Tools section. Results from these analyses are posted on the Assessments page when they become available, and descriptions of key regulatory outcomes for these analyses can be found at How ARIA Analyses Have Been Used by FDA.